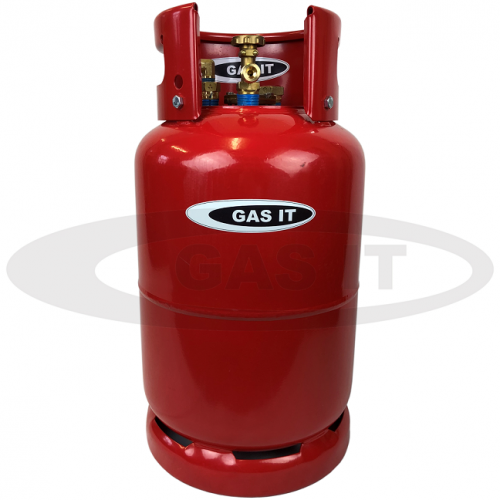 GAS IT 6 kg self refillable gas bottle for use in any Motorhome, Caravan, Campervan, Farrier & Catering Vehicles and Road repair companies - GAS IT Leisure Gas Bottles, Gas Cylincers and Gas Tanks - Catering, Motorhome, Campervan, Caravan, Farrier and Road Repair Refillable Gas Solutions. Top of the range and OEM specification 6kg GAS IT Plus upright refillable gas cylinder. These refillable GAS IT Plus bottles come fully valved with 4 High Quality, Latest Specification Valve set, and are used and fitted by OEM Motorhome builders here in the UK and Europe. Our GAS IT Plus bottles are fitted with 4 separately high specification, OEM specification valves, which gives better service results than any single multi valve type gas bottle. The separate valves as fitted to the GAS IT Plus bottles have many safety features not seen in other brands sold in the UK and Europe, which makes our GAS IT Plus bottles unique in many ways, so if you want the best safety built in to any refillable gas bottle as well as fantastic product functionality, and reliability, then this is the GAS IT Plus refillable bottle has to be for you. 2) Inside the Plus bottle we have the largest and best Liquid Phase Separator© on the Market, which stops any liquid from leaving the bottle - Gives Better results than any other bottle on the market. 3) Solid metal geared Level float system comes with a factory fitted simple level gauge ( clock face type on the bottle it's self ) which can be updated to allow both on bottle and remote gas level indication anywhere on the vehicle with a separately available GAS IT LED gauge and sender - To view the standard fitted mechanical indicator on this bottle means you need to look from the top or at an angle from the side. Removal of the transportable handle aids this viewing process or the use of a simple small mirror to view the level indicator on the odd occasion you want to see it will suffice. 4) Full size, large flow Pressure relief valve set at 27bar. Largest PRV on the market. 5) 80% shut off valve allows connection of any GAS IT or Gaslow fillpoint and which allows easy connection to our GAS IT bottles or even Gaslow's to allow multi bottle fills. The gas outlet on the manual tap is the UK specification 109 nut (21.8 LH) thread which is known as the butane nut & fitting. If you have a Propane pigtail ( UK POL) fitted to your existing gas install you can either buy a separate new 21.8 LH pigtail or a simple to install pol to 21.8LH adaptor - both are available from ourselves at an small extra cost.